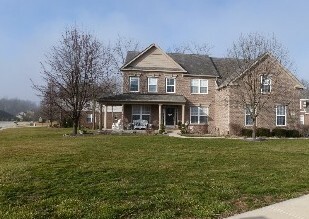 The beautiful home in Reserve at Bridgewater is situated on a magnificent lot with mature trees and open green space in one of Avon Indiana's favorite neighborhoods. From the moment you view the estately home you'll find plenty of reasons to want to kick off your shoes and make it home. Situated on a corner lot with a wrap-around porch, you'll spend many summer evenings relaxing here. The neighborhood was built by Drees homes between 1998 - 2003 and consist mostly of two story homes with over 3000 square foot of living space on large lots of gently rolling hills. Most homes in Reserve at Bridgewater have a basement and three car garage. There's also a community pool in the neighborhood. The home at 6379 Timberbluff Circle offers a majestic two story entry and foyer, with gorgeous staircase and catwalk overlooking the expansive great room. Spacious island kitchen has an abundance of cabinets and counterspace, a breakfast bar, built in desk, walk-in pantry and large eating area. Kitchen opens to the two story great room which features a fireplace, wall of windows overlooking the lush green backyard and lots of space for entertaining family and friends. There's also a formal dining room with a double trey ceiling, as well as a formal living room. The master retreat has everything on your wish list. Vaulted ceilings with ceiling fans, two walk-in closets, dual vanities, separate tub and shower, plus a exercise, office, or sitting room. Three additional bedrooms and bathroom complete the upstairs. The basement is finished with a bonus room and office. Make an appointment to see this home today. It is the only home available in the Reserve at Bridgewater right now.